Is roof insulation compressed providing the thermal performance that you are expecting? Does the compressed roof insulation under metal roof systems achieve SANS 10400 XA? Is Your Roof Insulation Really Thermally Performing As It Should? The Real Answer! The next few tabs will take you through a technical explanation as to how roof insulation should thermally perform, showing the difference between what performance you think you should be achieving, against the reality of what you are actually receiving. Roof insulation in buildings is used to reduce heat flow and is essential to keep a building warm in winter and cool in summer. A well-insulated and well-designed building will provide year-round comfort, decreasing energy costs. This, in turn, will reduce greenhouse gas emissions. The thermal performance of insulation is measured as the R-Value, also known as thermal resistance. The R-value is a guide to its performance as an insulator—the higher the R-value, the better the insulation (i.e., resistance to heat flow) it provides. 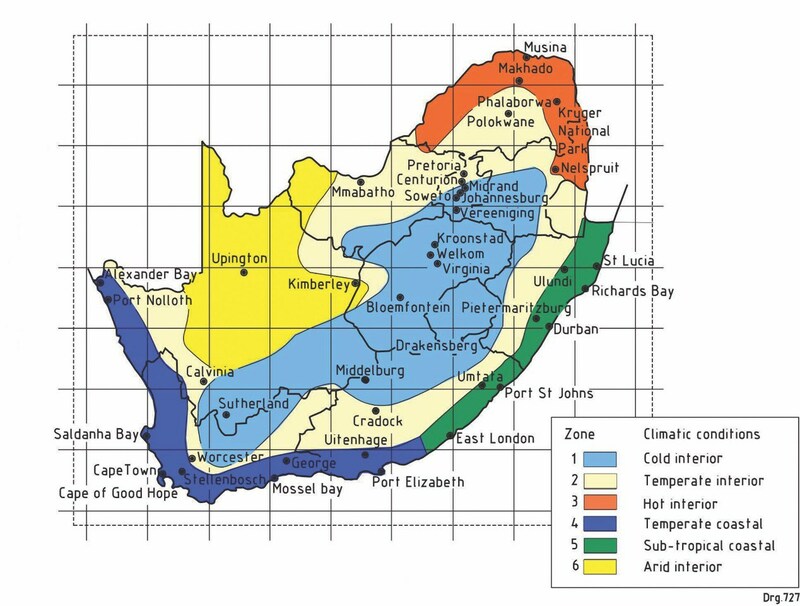 In south Africa the recommended R-Value for the relevant climatic zones & conditions will influence the appropriate level and type of insulation and are determined by SANS 10400 part XA & SANS 204. Is in compliance with the application of the South African National Building Regulations SANS 10400? Is in compliance with relevant South African National Standard (SANS) i.e. Product standard at SABS? Is appropriate for the intended occupancy class in accordance with SANS 10400 part A? Complies with the Fire safety requirements given in SANS 10400 part T and SANS 428. 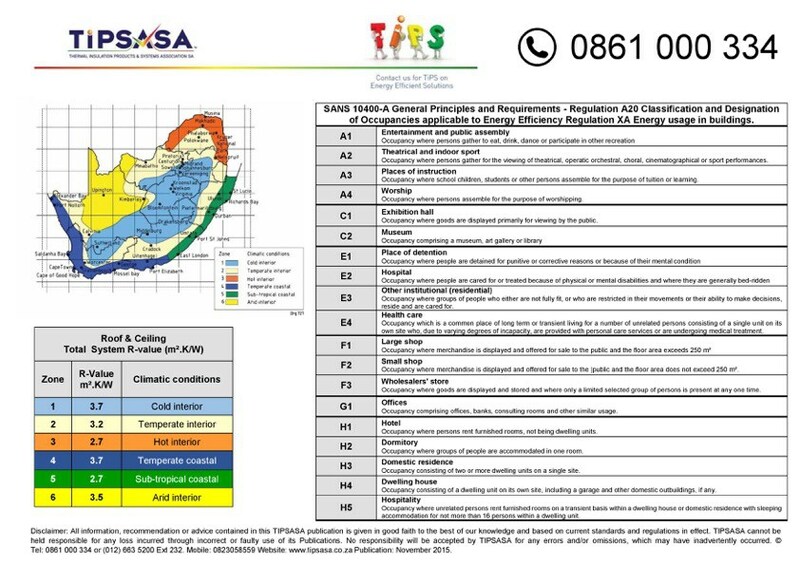 The below climatic zone maps and TIPSASA thermal specification guide provides the required thermal performance of the roof insulation depending on the location and the classification of the building. With the methods of construction used in Africa, is the roof insulation providing the minimum thermal performance as prescribed in SANS 10400 part XA and SANS 204? A recent series of compression tests were commissioned and carried out by Oxford Brookes University to establish the effect of compression on the thermal conductivity and thermal resistance of a glass fibre quilt under these particular site assembly conditions. The tests revealed that, when fixed directly below a steel roof sheet and/or packer, a 155mm glass fibre quilt with a density of 12kg/m3 is compressed at the purlin to a thickness of less than 5.0mm, resulting in a density of 328.6kg/m3. The thermal conductivity of the compressed insulation increased marginally from 0.038W/mK to 0.046W/mK, whilst the thermal resistance decreased dramatically from 4.079m2K/W to 0.109m2K/W. South African Building Standards stipulate that an overall minimum R-Value has to be achieved by building envelopes, but allows for insulation to cross purlin lines provided that a thermal break of 0.2m2K/W is introduced. The Oxford Brookes University test results confirmed that a compressed 155mm, 12kg/m3 glass fibre quilt between a single skin steel weather sheet and purlin does not achieve this required thermal break requirement.The results of the Oxford Brookes University tests, coupled with a distinct lack of credible thermal performance data on SA roof assemblies, prompted Ash & Lacy South Africa to undertake an accurate thermal simulation study using THERM 7.4.3.0 Thermal Simulation Software developed at Lawrence Berkeley National Laboratory. 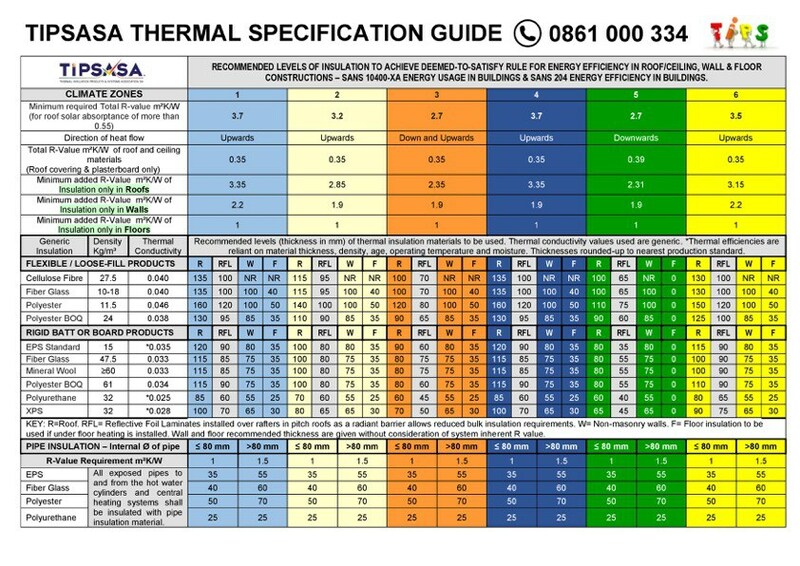 The aim of the study was to produce a comprehensive set of accurate and definitive thermal performance data for commonly used insulated roof assemblies in SA by means of thermal modelling, utilizing data obtained from practical field mock-ups, case studies, accredited third-party test results, and published material properties. Please note that all the R-Value % losses are compared to an uncompressed insulated roof system or control of the same thickness of insulation. The uncompressed insulated roof system for 75mm thick based on purlins at 1800mm centres or control for the below R-Value % losses to be compared against is a R- Value of 2.1451 m2.K/W. The uncompressed insulated roof system for 135mm thick based on purlins at 1500mm centres or control for the below R-Value % losses to be compared against is a R- Value of 3.7435 m2.K/W. Please note that 150mm of compressed insulation without a packer of spacer system should never be installed between the purlin and the roof sheeting. The pressure of the 150mm insulation compressed to 5mm, on the roof sheeting around the clip could potentially force the concealed fix roof sheeting off the clip. The uncompressed insulated roof system for 150mm thick based on purlins at 1500mm centres or control for the below R-Value % losses to be compared against is a R- Value of 4.0972 m2.K/W. SANS10400-XA stipulates that a prescribed minimum total R-value be achieved based on the building classification and geographical location. These minimum requirements are not being achieved in a large majority of new buildings being constructed in South Africa, due to compression caused by incorrect installation methods. This negatively impacts on the overall energy efficiency and associated operational costs incurred over the life cycle of the building. The Solution: The additional costs associated with installing an uncompressed insulated metal ‘built up’ roof system remain negligible when considering the cost savings achieved by insulation that ultimately achieves its full design capability over the life cycle of the building. Achieving energy-efficient, structurally sound and compliant roof assemblies no longer has to be an onerous task for professionals and contractors. With proven installation methods and tighter on-site quality control, bulk insulation, whether used in single skin or dual skin applications, can still achieve its well earned reputation as an affordable solution in achieving excellent thermal, acoustic and fire performance. 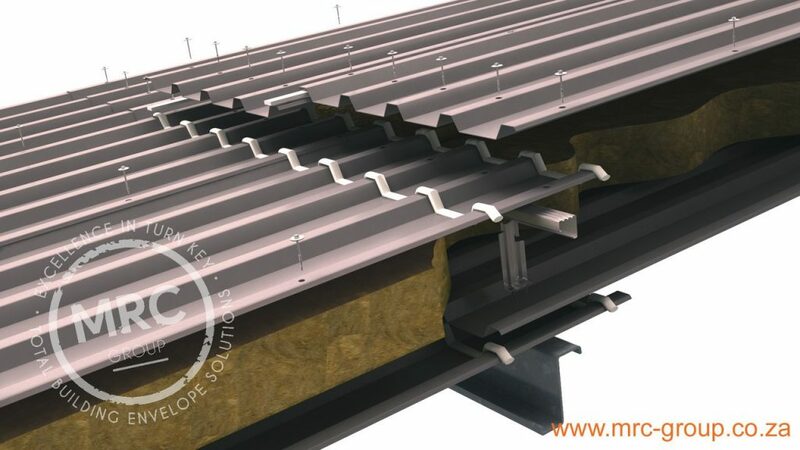 The obvious answer to providing the correct thermal performance or R-Values using a compressed insulated metal roof system, is to increase the thickness of bulk density roof insulation between the purlin and the roof system. Due to the compression of the insulation, the R-Value loss means that providing a thicker insulation would still not achieve the required thermal performance but the structural performance is far more profound. A strong stable roof system is all based around the fixings and the interaction between the purlins and the clips on a ‘concealed fix’ roof system. The most stable roof system has a ‘face to face’ contact between the clip and the purlin ensuring there can be no movement or rotation. The thicker the compressed insulation the further the clip is from the purlin providing opportunity for the clip to move or rotate. Example: 150mm of bulk density roof insulation can be compressed down to approximately 4mm in the localised position between the clip and the purlin. It has been suggested that additional fixings can be installed in the clips to ensure the clip is secured back to the purlin. However it must be noted that over time the insulation fibres between the clip and the purlin will break down and eventually cause an unsupported gap which could lead to the roof sheet disengaging from the clip. The installation of even 100mm of compressed bulk density roof insulation between the roof sheeting and the purlin will place additional upward pressure around the clip of a ‘concealed fix’ roof system, onto the underside of the roof sheeting. This additional upward pressure could potentially force the roof sheet off its clip, the thicker the insulation the more pressure that is applied to the underside of the roof sheeting. Although the roof sheeting may be engaged with the clip at installation stage, please beware that the ‘concealed fix’ roof system has been designed to allow for thermal movement. A 60 metre metal roof sheet could thermally expand / contract up to 120mm. With this level of thermal expansion and the pressure from below from the compressed insulation the roof sheet could potential disengage with the clip. Illustration of the upward pressure from the compressed insulation with potential disengagement with the clips. The Solution: MRC Africa’s ‘Built Up’ or ‘Double Skin’ roof or cladding solutions are at the cutting edge of energy efficient and high performing metal roof systems. A ‘built up’ metal roof system provides a vast array of options for the most advanced thermal and acoustic performance for buildings. A ‘built up’ metal roof system comprises of 2 skins of profiled metal roof sheeting separated by the patented AshGrid™ spacer system forming a structural cavity which is filled with uncompressed bulk density insulation ensuring the thermal and structural performance of the roof system. The bottom walkable liner provides a clean white soffit to the inside of the building, protection against wind uplift to the external roof sheeting and a safe platform to install the rest of the roof system. The thermal, acoustic and fire performance of the insulation material is based on the guarantee of its structural integrity. The structural integrity of the insulation is generally guaranteed up to the stated years, depending on the manufacturer who supplied the insulation. The product must be stored, handled and installed in accordance with the manufacturers recommended instructions. There is to be no physical damage caused to the product either during its installation or in subsequent periods. There is to be no ingress of water or other liquids due to leaks or any other manners which will cause loss of properties. Any such leaks will invalidate the product guarantee. There is to be a recorded maintenance plan to show it has been maintained in accordance with manufacturer’s recommendations. Failure of the above will lead to the product guarantee becoming invalid. There is a stark difference between a product guarantee & a system warranty. Most companies promote the headline of a long guarantee on a product or material BUT the important guarantee is the system warranty that covers all elements of the roof system. MRC Group’s up to 20 year ‘Guardian’ System Warranty cuts through the myth & mystic of product guarantees and workmanship warranties issued by the construction industry. Traditionally a product guarantee would be issued by the manufacturer and the workmanship warranty would be issued by the installer of the over-roofing system. Two separate pieces of paper, with differing length of terms and when put alongside each other, never answered the question of who will pay for the materials and works such the over-roofing system fail. ‘Guardian’ System Warranty is an unrivalled new era of warranty that covers Materials, Workmanship & Maintenance. The length of term for each element matches and is issued as a single source, transferrable warranty for the life of the guarantee of the insulated metal roof system. MRC Group challenges the construction industry to ensure that the workmanship warranty issued by contractors matches the length of term of the supplied insulated metal roof & cladding system, thereby ensuring high quality installations with designed and tested insulated metal roof & cladding systems.